1.770" (44.95mm) OD x 0.870" (22.09mm) ID x 0.355" (9.02mm) thick, C8 Ceramic Ring Magnet, magnetized through thickness. Ferrite ring magnets are great for use in many applications, which include use as motor magnets, sensor magnets, hobby magnets, craft magnets, consumer electronics magnets, and speaker magnets. Ceramic ring magnets can operate in higher temperature applications where a strong magnetic field is not needed. Ceramic is low cost, but the lower magnetic field produced by ceramic / ferrite magnets requires a larger size to get the field required. SM Magnetics, the engineering and manufacturing sister company of SuperMagnetMan, has been assisting Corporate customers for many years with their custom ring magnet and magnetic assembly applications. SM Magnetics works with Corporate customers to optimize their design and then manufacture the specific ring magnet or magnetic assembly to meet the required spec. SM Magnetics has their own ISO certified factories and controls the entire manufacturing process. For assistance from a technical representative at SM Magnetics, click here for the contact info. For a list of ceramic magnet materials and their characteristics, visit our Magnet Tables section. 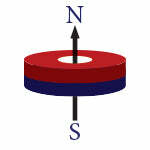 Use care and caution when handling neodymium magnets, as outlined in our Magnet Safety section.